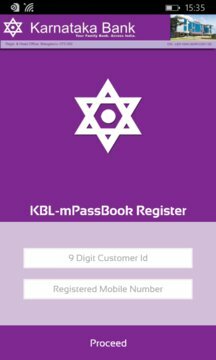 KBL-mPassBook is a mobile application [App], which facilitates Bank's customers to view/download statement of accounts in the form of passbook using their smart phones/tablets at their convenience without visiting the branch. View account details such as Name, Account Number, Balance outstanding, Branch Address & Phone number etc. View Pass book similar to physical one with first page displaying details of Branch as well as your personal information and transaction in subsequent pages. Create personalized ledger by categorizing the income & expenditure with remarks for each transaction. Opt the Menu Option from 12 languages [i.e. English, Hindi and 10 Regional languages] . Share account details through SMS/Email to facilitate remittance. Generate account statement in PDF/ Excel format and send to your Email. Locate our Branches and ATM's using Latitude and Longitude.